Bangor Erris Angling club was established in 1970. The Club waters, including a stretch of the Owenmore River – which runs through the town of Bangor Erris – and also Carrowmore Lake – located just outside the town of Bangor Erris, have without doubt become one of the most productive salmon and sea trout fisheries in the Island of Ireland. The club which has over ??? members also offers fishing to non club members and angling tourists on a daily or weekly basis. The club promotes fly fishing for salmon and seat trout primarily, though spinning for Salmon is allowed up until the end of March on Carrowmore Lake. The Bangor Erris Angling Club Fishery has become renowned for its premier angling throughout Ireland and Europe, attracting visitors from all parts of the EU as well as further afield with anglers having come from Brazil and the United States. The fishery is very unique because it offers fantastic angling opportunities for both advanced and beginner anglers who can choose from either Carrowmore Lake or the Owenmore River depending on which suits their abilities best, with the river offering for the most part obstruction free Fly Fishing. The Club has also completed extensive development works on both the river and the lake over the past years and is constantly looking at ways to further improve the experience for the visiting angler. Salmon fishing on the fly is very popular in Bangor Erris because anglers have a very good chance of catching a fish at any time throughout the season either in the river or the lake which is quite unusual. Many fisheries in Ireland and indeed Mayo ‘switch off’ at various stages throughout the angling season but this is certainly not the case in Bangor Erris. Both the lake and the river fish best at various stages throughout the year – Carrowmore Lake is renowned for being one of the most productive Spring Salmon fisheries in Ireland with consistent Spring Salmon catches each year usually from February till late May or early JUne with Salmon up to 16lbs having being landed recently on the fly. The Owenmore River will fish well – depending on weather of course – producing spring fish from Late April right through until June and even beyond. 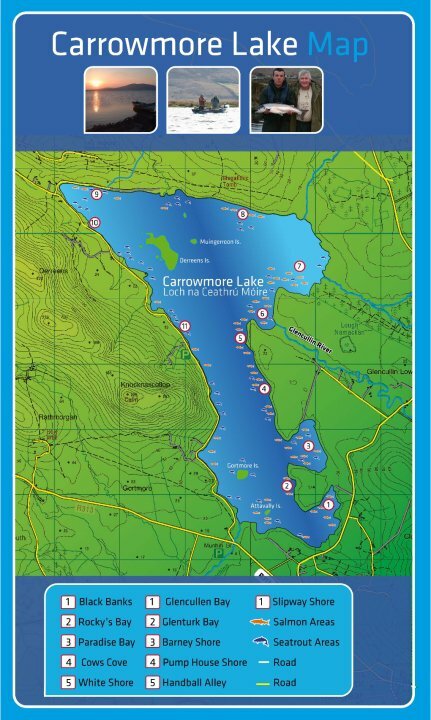 Carrowmore Lake then switches from Spring Salmon fishing to Grilse fishing usually in late June into July, and at this time the lake also offers absolutely superb Sea Trout Fishing to the fly. The Owenmore river really comes into its own in late summer leaving most other Salmon rivers behind in terms of catch numbers and the river will fish really well for Salmon ‘Harvest fish’ right until the end of the Season in late September.